Beauty Professor: Rouge Bunny Rouge Precious Velvet Flawless Face Powder...Swatches of All Four Shades! Rouge Bunny Rouge Precious Velvet Flawless Face Powder...Swatches of All Four Shades! Pressed powder is in the same league as foundation for me...I cannot seem to get enough. 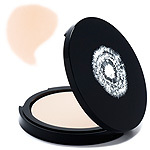 When placing my last Rouge Bunny Rouge order with Beautyhabit, I was very curious about the Precious Velvet Flawless Face Powder but couldn't find swatches of the four colors offered anywhere! Instead of ordering a compact blindly, I was provided with samples and am excited to share them with the blogosphere. Effortless radiance and sophistication in a pressed powder, with a texture so light it melds with your skin, making it naturally flawless. An advanced micronisation process guarantees a combination of a velvety and creamy texture for ultimate comfort, perfect adherence, smoothness and an even finish. Innovative ingredients include Papaya Fruit Extract as a natural “face lift” and skin softener, plus Hyssop Extract with soothing properties. Rice Powder imparts a perfectly natural, non-shiny finish. Compose your own concerto of impeccable loveliness. It seems to me that Piano, Piano Forte and Allegro are all very close in depth and tone and are most suitable for fair to light skin tones, though Piano Forte definitely seems the lightest of all. Adagio is a a touch darker and would work well on light to medium skin tones. As an NC 25 for most of the year, I think that I would order Adagio. While I haven't had the chance to wear it on my face all day, I can attest to the fact that the powder is indeed very smooth and finely milled. I hope that you find these swatches to be helpful! Thanks so much for your review, BP. Definitely looking forward to reading your future posts! Happy to oblige! It sounds like Adagio would be right for you too...take care.